Thanks for visiting my website, NELSAP! My name is Jeremy Davis and I am the founder of the New England Lost Ski Areas Project. This website is dedicated to preserving the vanishing history of New England Ski Areas no longer in operation. I was born in Lowell, Massachusetts in January of 1978, but spent my entire life up to college in Chelmsford, MA. I started skiing late, when I was 11, at Nashoba Valley Ski Area in Westford, MA. I really wasn't sure if I liked it that first year, and had major troubles getting down the 240 foot vertical hill. I kept plugging away at it, and the following season I visited my first big mountain, Cranmore, had a good time, and kept with it. I attended Chelmsford High School from 1992 to 1996, and was very active in the Ski Club, attending 6 night skiing trips per year to Wachusett and two other trips to Sunday River and Big Sky, Montana. While in high school, I worked on the Education Staff at the Acton Science Discovery Museum; teaching classes, helping visitors, and being a counselor for Summer Science Camp. I worked there until early 2000 (on breaks during college) when I finally had to leave to get ready for the real world. I was also very active in Scouting, holding many leadership positions in Troop 74 before attaining the highest rank in Scouting, Eagle, in 1996. The lessons I learned through Scouting have stayed with me ever since. Once I got my license in 1994, I finally had the freedom to ski whatever ski areas I wished. At least 2-3 times per month I took long drives all over the place to ski areas I had never been to before. I made it my goal to ski every area in New England, and so far have skied over 50 areas. 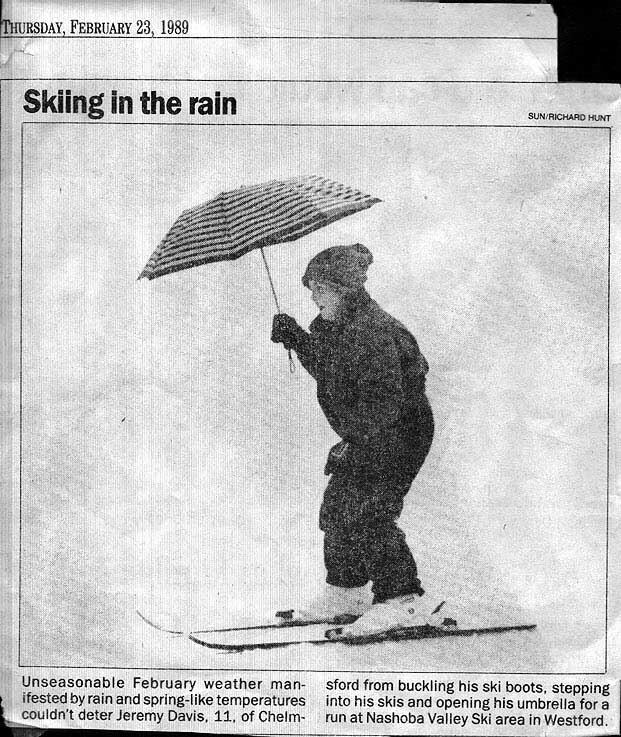 On February 22, 1989, I was skiing at Nashoba Valley in MA, where I had learned to ski only a few weeks prior. This photo appeared in the Lowell Sun the following day - good for a laugh! 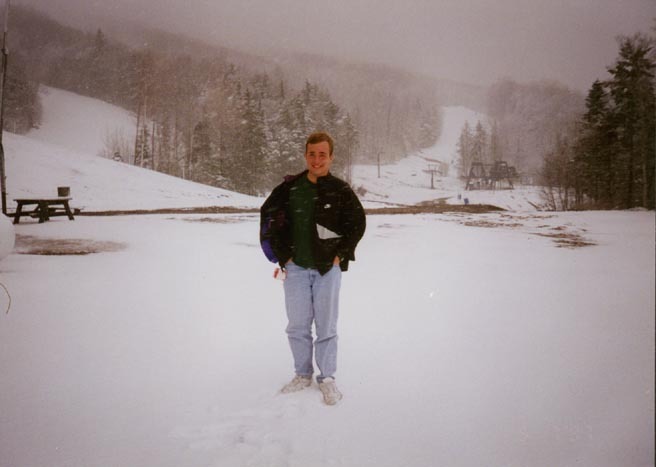 Enjoying a late season snowfall on May 7, 1997, at Burke Mountain! After graduating high school in 1996, I attended Lyndon State College in Lyndonville, VT, to major in Meteorology. I had been strongly interested in meteorology ever since I was 7, so it was a natural choice. While at Lyndon, I finally got to experience a true Vermont winter, seeing over 110" of snow and temperatures near 35 below. A far cry from eastern Massachusetts! Up there, it seems to snow every day, but I wasn't complaining. I got a season pass for Burke Mountain, even though I never skied there before. It was a wise decision, Burke offers some excellent terrain and usually decent snow conditions. I ended up buying a season pass each year, but by spring of 2000 I noticed that the mountain was not looking so healthy. It was nearly empty every day, even more so than usual. Turns out the area was foreclosed in summer of 2000, was auctioned off in September, and finally ended up in the hands of the Burke Mountain Academy. It plans on operating for the 2000-2001 season. Back to college, later in my sophomore year I became very involved with the LSC-AMS (American Meteorological Society) club, and it was suggested to me to run for a leadership position. I ran for the Public Relations Officer, and won. This position had two main jobs: to plan all events, and to make sure that the club had a good rapport with whoever we were dealing with. Two of my favorite events were planning the Mount Washington Hike and the Sugarbush Ski Trip. Several internships marked my college years. In 1997 and 1998 I interned at the Blue Hill Observatory, just south of Boston. This gave me hands on experience with official weather observations combined with a great view that most people don't get to see. In 1999 I lived out one of my goals, and spent a summer on Mt. Washington, NH. This was great, I finally got to experience snow in June, 90mph winds, and incredible sunsets. While up there, I got to hike on a weekly basis, and where I slept was literally just yards from the Appalachian Trail. Later in my Junior year I ran for Vice-President, and won that too. This time, I was in charge of the annual National Collegiate Forecast Contest and for planning the Panel Discussion at the Storm Conference. The Conference is held each year in Saratoga Springs, NY, and is a gathering of 250 professional meteorologists, students, and professors. This meant that I would have to speak and moderate a panel for 45min in front of 250 people. It went very well, and we had some great panelists. By Senior year, it was time to think about a job. Hearing that there was an opening at Weather Routing in Glens Falls, NY, I applied. I went down for an interview in April, 2000, and was hired. After graduating from college with my degree in Meteorology and a minor in Math, I had less than three weeks to move to Queensbury, NY. I would be working one town south, in Glens Falls. I moved in early June 2000, and began work. I have worked there every since. Originally forecasting for yachts and cargo ships, my duties now include being the manager of our local weather forecasting branch, North Country Weather. I also forecast for North News 8 in Glens Falls, NY, providing weather segments for the evening news half of the weekdays of the month, at 5:30PM. In September 2000 I was selected by Glenn Parkinson of the New England Ski Museum to serve on the Board of Directors of the Ski Museum, and was elected to this at the annual meeting. I am truly honored to serve in this position. I'm the youngest person on the board, and am the youngest person ever elected. In 2004 I moved to just outside of Saratoga Springs, NY - a fantastic small city that offers up a lot. We're close to Boston, New York City, Montreal, the Adirondacks, Catskills, and Greens, many lakes, rivers, etc. Outside of NELSAP, I enjoy growing carnivorous plants, tending a garden, lots of reading, travel, cooking, etc. I never imagined the site would grow to the level where it is at now - and for that, I have the many lost ski area enthusiasts out there to thank! I hope you enjoy visiting the site, and please let me know your comments!